“Live where you can, be happy as you can.” That pretty much sums up the feeling I got from The Gospel at Colonus, which I saw today at the Ordway Center in St. Paul. It’s a retelling of Sophocles’ Oedipus at Colonus using gospel music. You remember Oedipus, he’s the one who accidentally killed his father and married his mother (and they say soaps have crazy plotlines). Oedipus at Colonus tells the story of when he comes to Colonus at the end of his life, and finds peace and redemption after his long troubled life. This story is powerfully and effectively told through gospel music. If the mixture of Greek tragedy and gospel music has you confused, consider this quote from Lee Breuer (book and lyrics): “Zora Neale Hurston made the connection between Greek tragedy and the sanctified church many years ago. 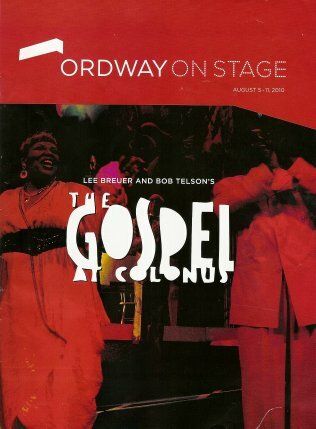 The Gospel at Colonus is a proof of her hypothesis.” The talented cast includes the Triad: 4Christ chorus, the Blind Boys of Alabama (who actually are blind, which seems quite obvious now), and local favorites the Steeles (Jearlyn, Jevetta, JD, and Fred). The four Blind Boys all play Oedipus as a sort of chorus, with the oldest of the group as the main Oedipus. He’s this little, bald, frail looking old man, but boy can he sing! And when he sings he doesn’t seem frail at all, jumping up and down and waving his arms. It’s the kind of show that makes you want to clap and sing along, and makes it difficult to sit still in your seat. The framework of the story is a preacher who is preaching “the book of Oedipus.” The preacher is played by Rev. Dr. Earl F. Miller, a real-life preacher in St. Paul who has been playing this role since he took over for Morgan Freeman on Broadway. In fact, many of the cast have been involved with the show since its inception, including the Steeles. The story comes to life as the preacher tells it, and we meet Oedipus’ sister/daughters, who have always supported him, and his brother/son, who has not. We are taken through the emotions of Oedipus’ life and rejoice with him when he finally finds peace. sounds like it was a good time. i'm glad you enjoyed it.